Happy Sunday! I am actually pretty happy as I am finally finished writing my report cards. Unfortunately I need to go in to work today and spend a few hours setting up for our 100th Day of School celebration tomorrow. On Friday we did a really fun math lesson to work on addition and subtraction strategies. First we watched this video, to remind us what we had learned about bears and hibernation in science. We talked about what they eat and how they live alone too! Then I read the book "The Very Hungry Bear". We talked about why the bear might be hungry and discussed why the polar bear had to find just the right place to live (habitat and adaptations!!). We talked about what an igloo was and why it was the perfect home for the polar bear. Next I brought out a coffee filter and placed it upside down on our carpet (in the middle of the students) and explained this was our igloo. I took some bears (the manipulative ones!). I told the students how many I had altogether. I put some under the filter and some outside of the filter. 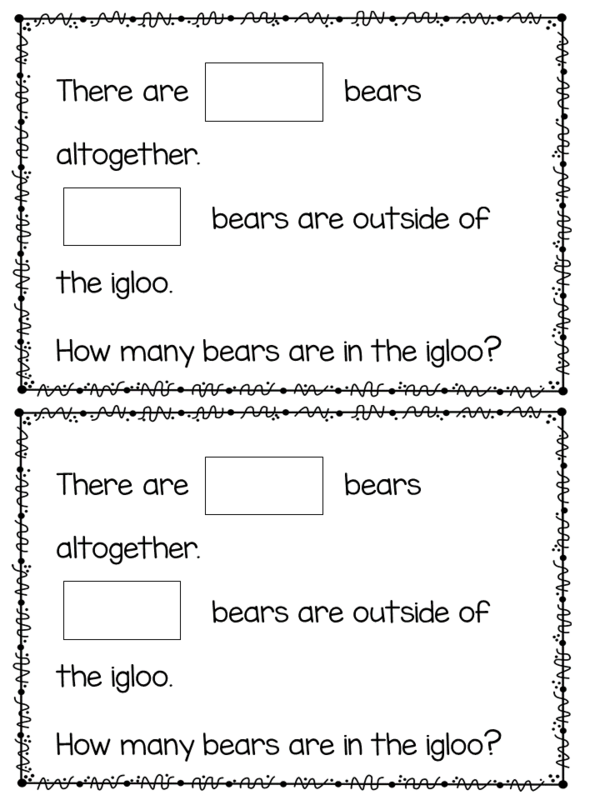 I asked students "If there are 9 bears altogether and 4 are outside of the igloo, how many are inside the igloo?" We focused on how they found their answer - if they were counting up or counting back (the two most popular strategies right now). Next I gave my students each an igloo and some bears. They had to create a problem for their partner to solve and then switch with their partner. This was a big hit!! At the end of the day I gave each student a coffee filter igloo and some gummy bears. They created a problem, recorded their problem and then brought it all home to share with their parents. Hope you had a great weekend, I'll be back to post pictures from our 100th Day ! !